I had the pleasure to meet and have a new friend in the war against Chronic pain, TBI and PTSD with Veterans. My friend Glenn Towery is Chairman & Founder of the Veterans Suicide Prevention Channel. Glenn served in the Vietnam war.Glenn has created and founded the Veterans Suicide Prevention Channel (VSPChannel), America’s first national broadcast channel for veterans and their family members. Veterans Suicide Prevention Channel can be accessed nationwide online at www.vspchannel.com. The channel is also available on the Department of Veterans Affairs secure online system as of January 5th, 2016. This VSP Channel is designed to broadcast shows that promote wellness to veterans who suffer with PTSD, anxiety and emotional/mental illnesses as well as physical ailments created by their military service for America and after service as well. when it comes to the human body is rare for me. To meet a person who genuinely cares for others fantastic. Below you will find a link to the 35 minute video of our meeting that I just completed editing. Please review it, I hope you like it. It is my intention to post it on our website next week. Please feel free to share it with others. If you are a veteran and need help, please contact Glenn from the phone numbers above on his Veterans Suicide Channel website. Thank you Glenn for your work my friend, and your good heart to try and make a difference. For more information on our research and projects, please go to our non profit website at www.vandryhope.org, and for our amazing Mriacle oil product go to http://www.stjudesmiracleoil.com/. DISCLAIMER Information within this site is for educational purposes only. The U.S. Food & Drug Administration has not evaluated statements about the product efficacy. These products are not intended to diagnose, treat, cure, or prevent any disease. So what does that mean? OM can be viral or bacterial. The problem with this is if antibiotics are prescribed, and it is more viral, antibiotics do not have any effect on viruses, only bacteria. Acute otitis externa is a common condition involving inflammation of the ear canal. The acute form is caused primarily by bacterial infection, with Pseudomonas aeruginosa and Staphylococcus aureus the most common pathogens. Topical antimicrobials or antibiotics such as acetic acid, aminoglycosides, polymyxin B, and quinolones are the treatment of choice in uncomplicated cases. However, there is no good evidence that any one antimicrobial or antibiotic preparation is clinically superior to another. 1. Neomycin/polymyxin B/hydrocortisone preparations are a reasonable first-line therapy when the tympanic membrane is intact. 2. Oral antibiotics are reserved for cases in which the infection has spread beyond the ear canal or in patients at risk of a rapidly progressing infection. Otitis externa, also called swimmer’s ear, involves diffuse inflammation of the external ear canal that may extend distally to the pinna and proximally to the tympanic membrane. The acute form has an annual incidence of approximately 1 percent1 and a lifetime prevalence of 10 percent.2 On rare occasions, the infection invades the surrounding soft tissue and bone; this is known as malignant (necrotizing) otitis externa, and is a medical emergency that occurs primarily in older patients with diabetes mellitus.3 Otitis externa lasting three months or longer, known as chronic otitis externa, is often the result of allergies, chronic dermatologic conditions, or inadequately treated acute otitis externa. A Miracle oil consumer contacted me regarding her son’s ear infection. 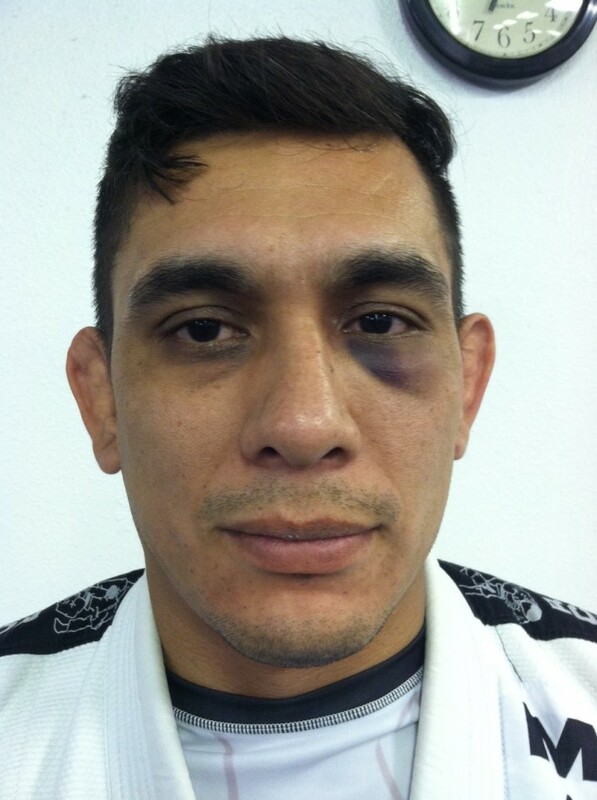 He was not able to make his Jiu-jitsu classes, and she had taken him to the ER. Both ears were bleeding, which is very extreme for an ear infection. Immunocompromise (eg, HIV), Diabetes mellitus, Narrow external auditory meatus (hereditary or acquired through chronic infection, exostoses), Obstruction of normal meatus – eg, keratosis obturans, foreign body, hearing aid, hirsute ear canal. If you or your child has an ear infection, or bleeding, you should immediately take the child to an ER. Also, an Ear, Nose and Throat specialist may find the source. Either way, you should treat this with utmost concern, and not to home diagnose it. Very frightening. She asked me if the Miracle oil could help as his pain and discomfort were difficult. Of course, I told her I do not prescribe any type of medication, but we have had consumers with tinnitus (ringing in the ear) that have told us they have reduced their tinnitus when applying oil to the back of the ear. So after his treatment by his PCP, her son had his ears cleaned. His ears were still in pain. I know ear wax can at times not be fully cleaned, even with alcohol. She brought him by, and we did have qtips. We put oil on the qtips, and gently applied around his back of his ear and gently around the ear. Her son rubbed the oil with his finger inside of his ear. We were shocked to see despite a cleaning from the ER, I had a feeling more wax would come out. He actually felt some coming out, and he showed us on his fingertip. The medicinal properties of peppermint oil are analgesic, anti-septic, anti-inflammatory, and antimicrobial, among others5. Clove bud has anti-infectious properties include: anti-viral, anti-bacterial, anti-fungal effects6,7. If you have a child with hearing loss, or possible ear infection, take him to an ER or your PCP. You can also make an appointment with an Ear, Nose and Throat specialist for any testing of hearing loss, infection, ruptured drums and many other conditions related with ear infections or conditions. 1. Rowlands S, Devalia H, Smith C, Hubbard R, Dean A. Otitis externa in UK general practice: a survey using the UK General Practice Research Database. Br J Gen Pract. 2001;51(468):533–538. 2. Raza SA, Denholm SW, Wong JC. An audit of the management of acute otitis externa in an ENT casualty clinic. J Laryngol Otol. 1995;109(2):130–133. 3. Rubin Grandis J, Branstetter BF IV, Yu VL. The changing face of malignant (necrotising) external otitis: clinical, radiological, and anatomic correlations. Lancet Infect Dis. 2004;4(1):34–39. 5. Mullally BH, James JA, Coulter WA, Linden GJ. The efficacy of a herbal-based toothpaste on the control of plaque and gingivitis. J Clin Periodontol. 1995;22(9):686–9. 7. Curr Med Chem. 2003 May;10(10):813-29.Antibacterial and antifungal properties of essential oils. Kalemba D, Kunicka A.Source Institute of General Food Chemistry, Technical University of Lodz,Poland. 8. Microbios. 1996;86(349):237-46. Antibacterial and antifungal activity of ten essential oils in vitro. Pattnaik S1, Subramanyam VR, Kole C.
12. Inhibition by the essential oils of peppermint and spearmint of the growth of pathogenic bacteria. Imai H1, Osawa K, Yasuda H, Hamashima H, Arai T, Sasatsu M.
St Jude’s Miracle Oil® vs. parasites, mites, ticks, fleas and head lice! Miracle oil has been used in many different ways, for inflammation, infection, burns, wounds, and many other consumer uses that can be viewed elsewhere with references on this website. We have two dogs, Samson and Delilah. They are two wonderful Pit bulls, and are very loving to anyone that lets them climb all over them. 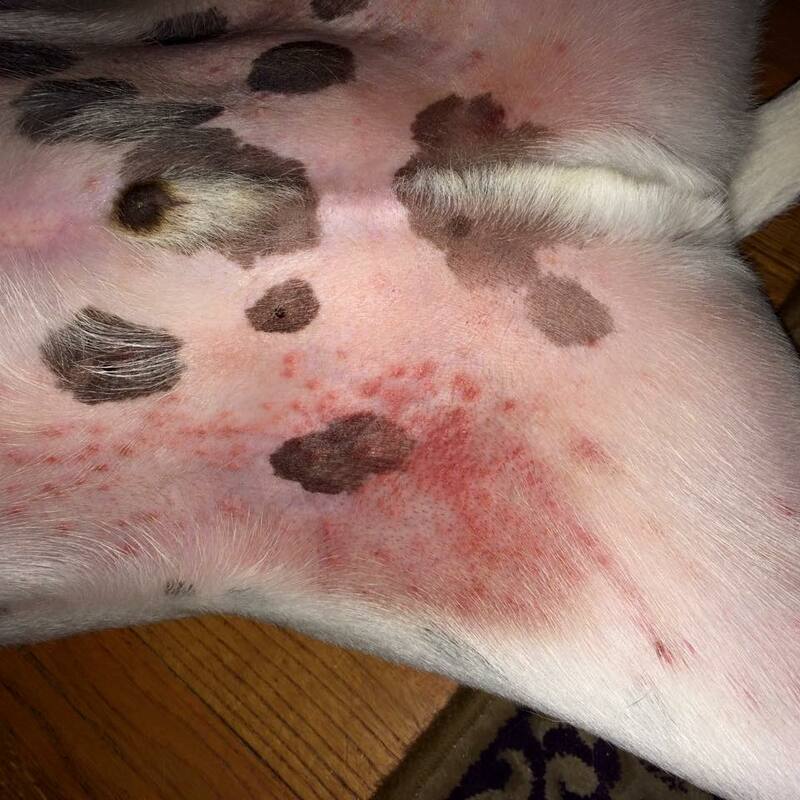 Unfortunately dogs get rashes, fleas, ticks, lice and other parasites along with the usual outdoor causes. We’ve shown studies regarding evidence on Staph, bacteria, E coli, Candida, Eczema and fungi you can find NCBI referenced on our blog. I have heard a huge dread and fear recently from friends and people with children in schools regarding lice or other similar parasites. Here we will break down some insects or parasites vs. essential oils found in our product. Eucalyptus, geranium, and lavender together without any other oils in this study are a very effective mosquito repellent.3 Frankincense4, and Myrrh5, are lethal to larvae of mosquito. Recently, a friend of mine notified me they knew someone who’s child had head lice in school. This is very common, and unfortunately there are no official solutions. I told them about our Miracle oil product, and references to medical journals show a positive light on the essential oils in our product against lice. 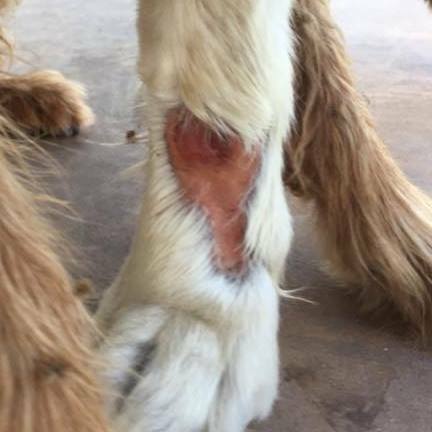 We have used our oil on our dogs for rashes, poison ivy, and elsewhere on this website you can view its effect against burns, bee stings, and even the one anecdotal case of the dog that was bitten by a rattlesnake. Researchers found that head lice (Pediculus humanus capitis) in 42 of the 48 states studied carry an average of three genetic mutations that make these bugs impervious to popular over-the-counter anti-lice remedies. In the remaining six states, the lice had zero, one or two of the three mutations, on average, the researchers reported in the study, published online March 31 in the Journal of Medical Entomology. “Parents should turn to physicians first instead of trying to treat their children themselves with over-the-counter products”, said report lead author Dr. Ellen Koch, dermatologist with the University of Pittsburgh Medical Center. That’s great! Thank you to all our consumers, and feel free to go to our facebook page, and feel free to contact me. 1.Effects of aspirin and acetaminophen on the liver. 4. Parasitol Res. 2006 Sep;99(4):473-7. Epub 2006 Apr 27. 8. Pirali-Kheirabadi, K., Razzaghi-Abyaneh, M. & Halajian, A. (2009) Acaricidal effect of Pelargonium roseum and Eucalyptus globulus essential oils against adult stage of Rhipicephalus (Boophilus) annulatus in vitro. Veterinary Parasitology, 162, 346–349. 11. Perrucci, S., Cioni, P.L., Flamini, G., Morelli, I. & Macchioni, G. (1994) Acaricidal agents of natural origin against Psoroptes cuniculi . Parassitologia (Rome), 36, 269–271. Perrucci, S., Macchioni, G., Cioni, P.C., Flamini, G., Morelli, I. & Taccini, F. (1996) The activity of volatile compounds from Lavandula angustifolia against Psoraptes cuniculi . Phytotherapy Research, 10, 5–8. 12. Pirali-Kheirabadi, K., Razzaghi-Abyaneh, M. & Halajian, A. (2009) Acaricidal effect of Pelargonium roseum and Eucalyptus globulus essential oils against adult stage of Rhipicephalus (Boophilus) annulatus in vitro. Veterinary Parasitology, 162, 346–349. 13. Poultry red mite. The poultry red mite, Dermanyssus gallinae (De Geer) (Mesostigmata: Dermanyssidae), has been the subject of extensive acaricide assays using a wide range of essential oils (Kim et al., 2004; George et al., 2009a, 2010a, 2010b). contact exposure to 0.21 mg/cm2 of essential oil of lavender (Lavandula angustifolia) in a closed chamber resulted in >70% mortality if the oil solution was applied to the filter paper 3min prior to exposure (George et al., 2008). 14. Perrucci, S., Cioni, P.L., Flamini, G., Morelli, I. & Macchioni, G. (1994) Acaricidal agents of natural origin against Psoroptes cuniculi . Parassitologia (Rome), 36, 269–271. Perrucci, S., Macchioni, G., Cioni, P.L., Flamini, G. & Morelli, I. (1995) Structure/activity relationship of some natural monoterpenes as acaricides against Psoroptes cuniculi . Journal of Natural Products-Lloydia, 58, 1261–1264. 15. George, D.R., Callaghan, K., Guy, J.H. & Sparagano, O.A.E. (2008) Lack of prolonged activity of lavender essential oils as acaricides against the poultry red mite (Dermanyssus gallinae) under laboratory conditions. Research in Veterinary Science, 85, 540–542. 16. George, D.R., Smith, T.J., Shiel, R.S., Sparagano, O.A.E. & Guy, J.H. (2009a) Mode of action and variability in efficacy of plant essential oils showing toxicity against the poultry red mite, Dermanyssus gallinae. Veterinary Parasitology, 161, 276–282. 17. Perrucci, S., Cioni, P.L., Flamini, G., Morelli, I. & Macchioni, G. (1994) Acaricidal agents of natural origin against Psoroptes cuniculi . Parassitologia (Rome), 36, 269–271. 18. Talbert, R. & Wall, R. (2012) Toxicity of essential and non-essential oils against the chewing louse, Bovicola (Werneckiella) ocellatus. Research in Veterinary Science, 93, 831–835. 19. The potential effectiveness of essential oils as a treatment for headlice, Pediculus humanus capitis. 22. Efficacy of spray formulations containing binary mixtures of clove and eucalyptus oils against susceptible and pyrethroid/ malathion-resistant head lice (Anoplura: Pediculidae). 23. Insecticidal activity of individual and mixed monoterpenoids of geranium essential oil against Pediculus humanus capitis (Phthiraptera: Pediculidae). 24. Eucalyptus essential oil toxicity against permethrin-resistant Pediculus humanus capitis (Phthiraptera: Pediculidae). 25. Interspecific hybridization of Eucalyptus as a potential tool to improve the bioactivity of essential oils against permethrin-resistant head lice from Argentina. 27. Insecticidal activity of plant essential oils against Pediculus humanus capitis (Anoplura: Pediculidae). Ironically, with veterans I know, first aid came to a discussion last year. 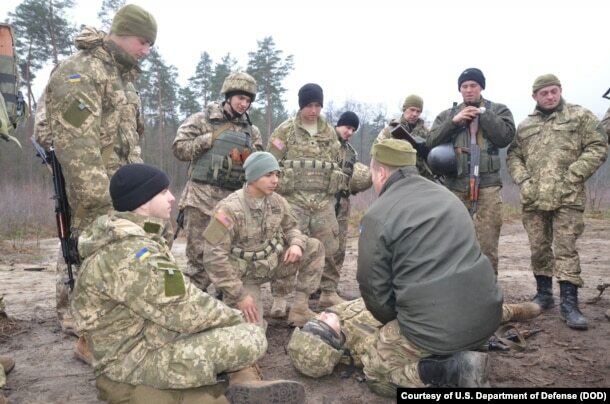 I originally started writing this article earlier this year on Military first aid. Since today is Veterans day 2016, I decided to finish it. and providing shade from direct sunlight during hot weather, or covering to prevent body heat loss during cold weather. Prompt treatment for pain will make an injured person feel more calm and comfortable. Pain relief may also make it possible for the person to move safely on her own — a handy thing if the nearest phone is miles away. Pain can also be a guide to treatment. – Over-the-counter pain relievers such as acetaminophen or nonsteroidal anti-inflammatory agents (NSAIDs) such as ibuprofen. – Instant-activating cold packs to treat the pain of insect bites, bruises, and scrapes. – Cold packs can also be applied to sprains and strains. – ACE bandages, can be used to wrap injuries to muscles, joints, or bones.First- and second-degree burns. – Cover the burn with sterile gauze. Sprains, strains, dislocations, and fractures. – RICE — rest, ice, compression, and elevation — is the best first aid strategy for painful injuries to muscles, joints, and bone injuries. Bruises and scrapes. – Gently clean areas with broken skin with cool water and cover them with a bandage. – Hold a cold pack on the area to reduce pain and swelling. – Minor cuts simply need to be washed with soap and water, treated with an antibiotic ointment, and covered with a clean bandage. – Apply pressure if the bleeding doesn’t stop on its own after a few minutes. – Seek prompt medical help if the cut is still bleeding after 10 minutes, if the wound is very dirty, or if you think stitches will be necessary. – Wash the area with soap and water, then apply ice or a cold pack to reduce pain and swelling. – Apply a cold compress, and use topical steroid ointments or oral antihistamines to relieve itching if needed. Infections are a primary cause of concern in first aid. From: First Aid Care for Surgical Wound Infections. Care for surgical wound infections will usually require antibiotic therapy. Over-the-counter or prescription pain killers may also be recommended. 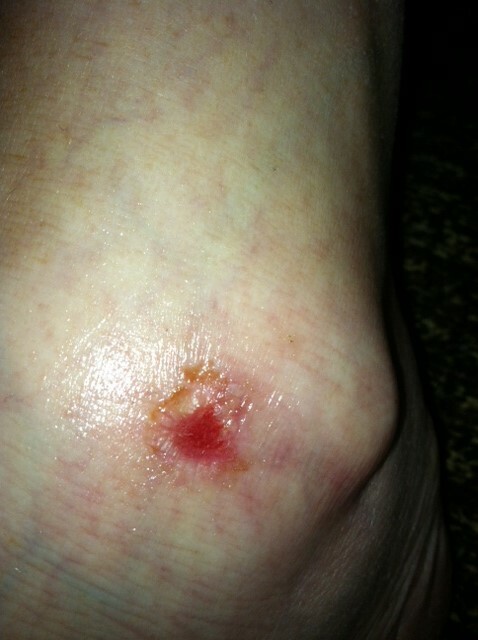 Depending on the infection, the doctor may need to remove the sutures and drain the wound. A debridement procedure may be necessary to remove dead tissue preventing healing. If we look at essential oils, and specifically the ones in the SJMO product, compare medical sources. We would like to see if we can get the funding to do a project with the Military and our SJMO. We would hope to do a trial test one day on a CAM therapy, and definitely to discuss more on hopeful projects. 6.Mathieu et al., 2006; Menke et al., 2007 Wintergreen essential oil same as birch? www.experience-essential-oils.com/wintergreen-essential-oil.html. 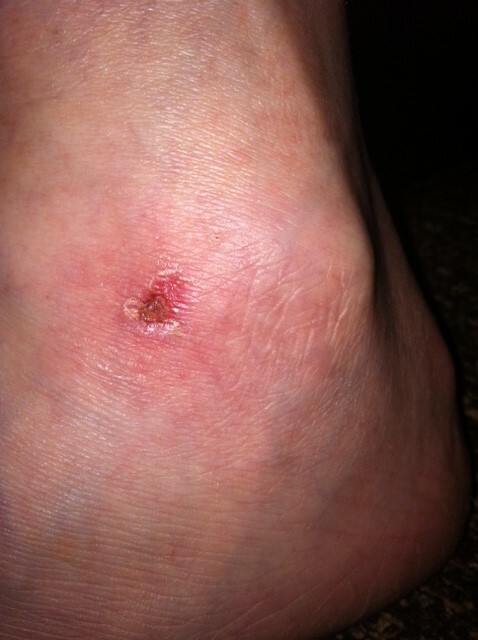 – See more at: http://www.woundsresearch.com/article/palliative-wound-treatment-promotes-healing#sthash.gcCu3Nsi.dpuf Curr Med Chem. 2003 May;10(10):813-29. 7.Antibacterial and antifungal properties of essential oils. Kalemba D, Kunicka A.SourceInstitute of General Food Chemistry, Technical University of Lodz, Poland. 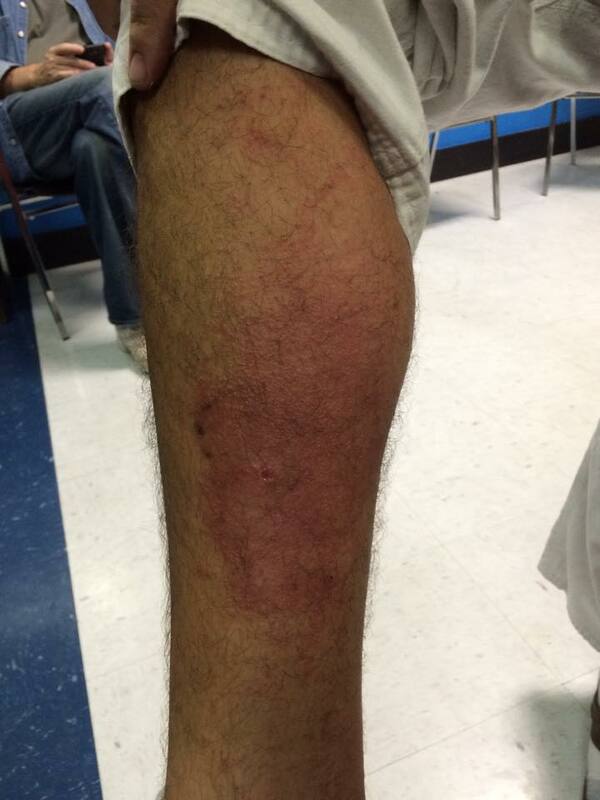 1/30/15 baseball pop fly injury. 1/31/15, 8 hours later the eye swelling is not as prominent after applying Miracle oil. 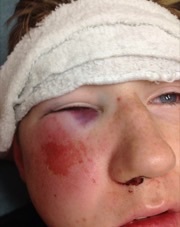 2/2/15, almost 60 hours later the eye swelling is almost normal, excluding the bruising and scrape. 2/4/15, appointment with surgeon showed he had five breaks in the socket. 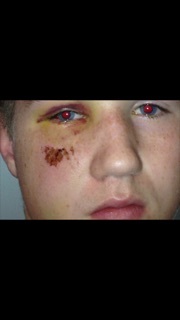 Excluding bruising and scab, the eye swelling appears normal. What is an orbital socket injury? 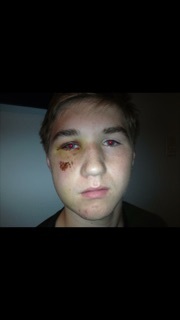 I have a facial fracture, how long will it take to heal? 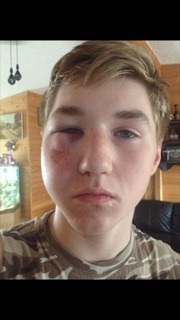 Considering the weeks and months it normally takes to reduce swelling and inflammation, the testimony from the parent gives a hopeful possibility for orbital injury swelling.5 Enjoy it below! 5. Testimony from parent Heather Watson. My testimonial. The proof is in the oil!! St Jude’s Miracle Oil that is!!! Thanks for reaching out and spending so much time talking with me! The wealth of information is greatly appreciated! Below is the success I had using your oil on my son. The 2 pictures above were taken at approximately 10:30pm on 1/30/15, Friday, about 3 hours after he took a 60mph pop fly to the eye. 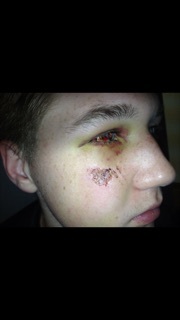 We got home from the hospital at 4am and around then I applied miracle oil just under the eye and on the eyelid. This is 1/31/15 the morning after applying 1 time. (About 8 hours after applying once!!) 😊 His eye is open!! The following 3 pictures were taken that Monday, 2/2/15 which was 60 hours of the 1st application and after applying 2 times per day for the weekend. So much swelling has been reduced! Side view of the MAGIC!!! These last 2 were taken 2/4/15. We saw the surgeon this day. These were actually taken at his office. 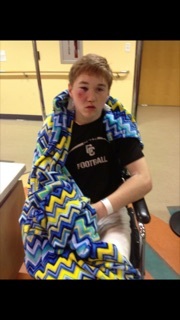 In the initial exam they told us he had broken the orbital socket in 2 places. 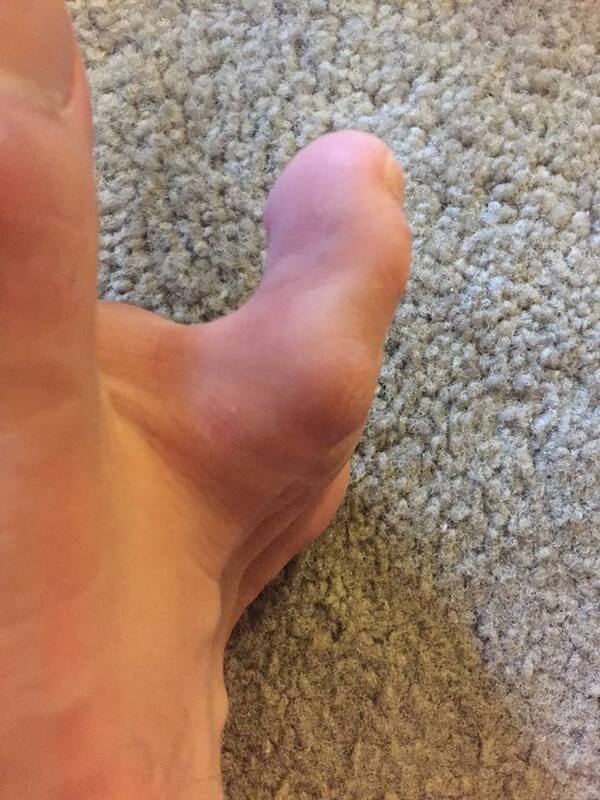 On 2/4/15 we learned there were actually 5 breaks but because of all the swelling it wasn’t visible in the 1st x-ray. Pretty powerful stuff!!!! Got Pain? 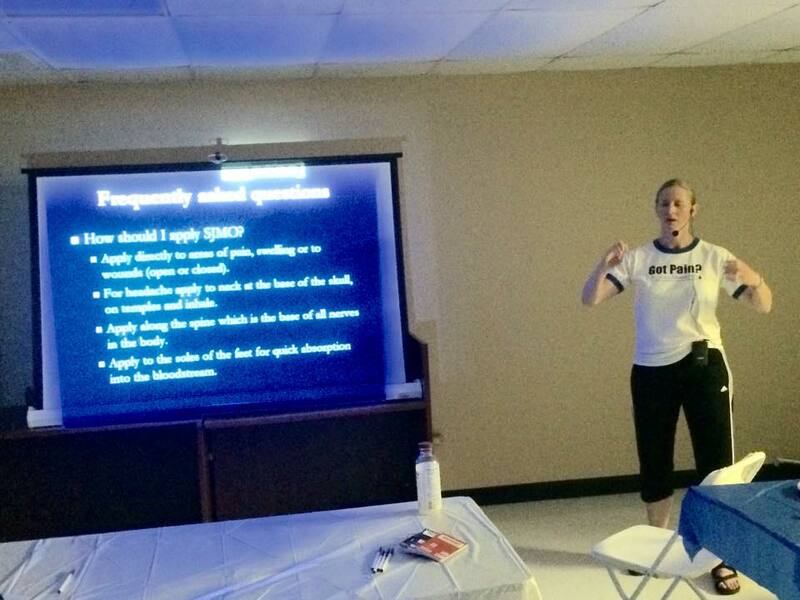 clinic lead speaker Chandra Vandry, RN covered chronic pain, insomnia, and new topics such as Got sight?, medical research regarding legal blindness and poor eyesight based on studies regarding Vitamin A deficiencies from medical studies. 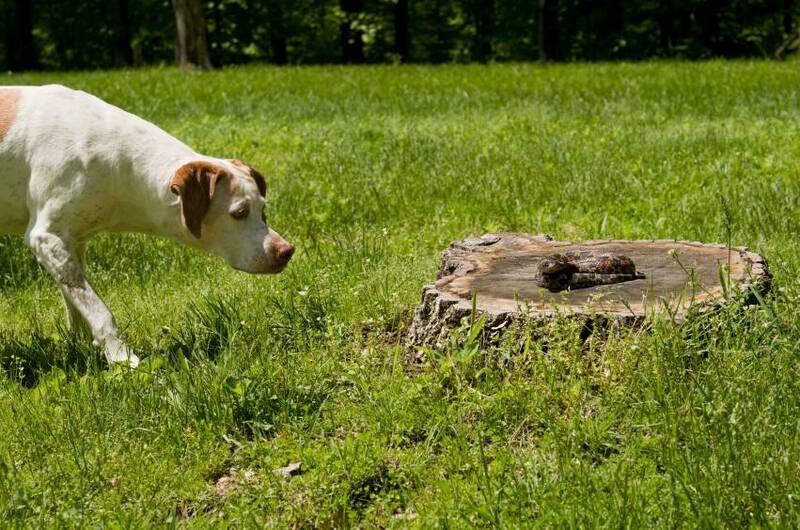 In addition, a new topic on Got canine pain? covered canine arthritis, immunity, nutrition and Canine paralysis. A video demo was displayed on a paraplegic dog that had regained its ability to walk, run and jump again based on light therapy, nutrition, detoxification and removal of cartilaginous tissues that cause paralysis or strokes in canines. Disclaimer: Information within this site is for educational purposes only. The U.S. Food & Drug Administration has not evaluated statements about the product efficacy. These products are not intended to diagnose, treat, cure, or prevent any disease. Consult your physician before using for advice. From the same website, here are photos of burn wounds in the first, second and third degree. Burn injury is the destruction of the layers of the skin and associated structures. 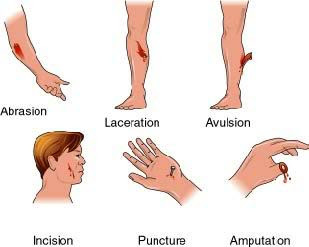 Burn injury is the destruction of the layers of the skin and associated structures. 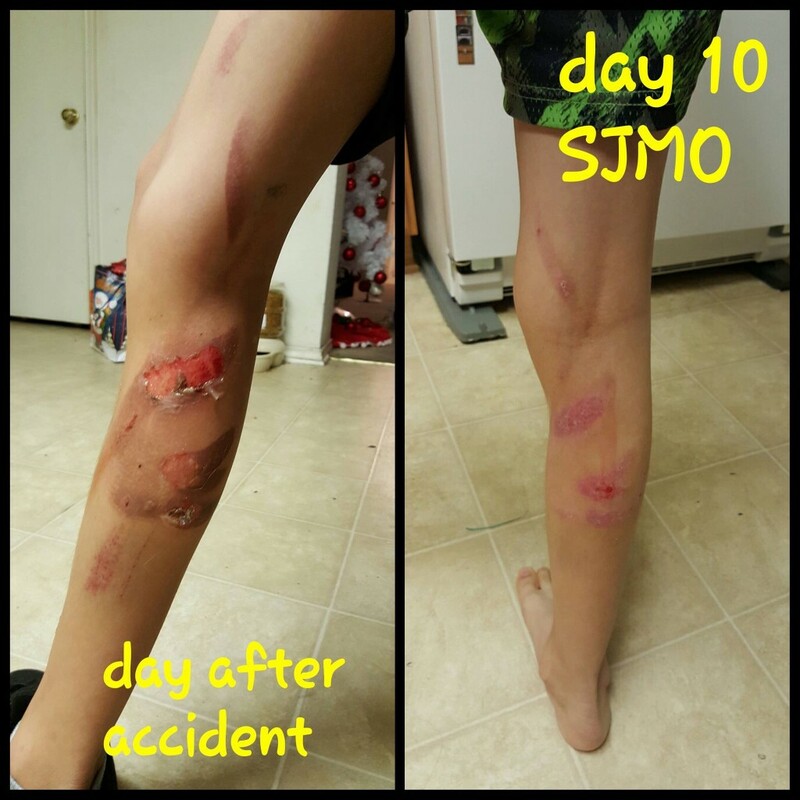 Regarding wounds, I researched our oils in the St. Jude’s Miracle oilTM product, and compared them with medical journals on potential EO may have on wounds or burns. What does the NCBI or Pubmed state oils we also have in our product do? Here are medical references regarding the some of the same oils in or product. Before I start, a few things on evidence. Anecdotal trials can be a testimony, a hearsay statement or a claim without backing. Wikepedia defines Anecdotal evidence as considered dubious support of a generalized claim; it is, however, within the scope of scientific method for claims regarding particular instances, for example the use of case studies in medicine. general, the strongest tests of hypotheses come from carefully controlled and replicated experiments that gather empirical data. If a particular hypothesis becomes very well supported a general theory may be developed. Although procedures vary from one field of inquiry to another, identifiable features are frequently shared in common between them. The overall process of the scientific method involves making conjectures (hypotheses), deriving predictions from them as logical consequences, and then carrying out experiments based on those predictions. A hypothesis is a conjecture, based on knowledge obtained while formulating the question. The hypothesis might be very specific or it might be broad. Scientists then test hypotheses by conducting experiments. Under modern interpretations, a scientific hypothesis must be falsifiable, implying that it is possible to identify a possible outcome of an experiment that conflicts with predictions deduced from the hypothesis; otherwise, the hypothesis cannot be meaningfully tested. Below are some interesting tests regarding the Miracle oil product. 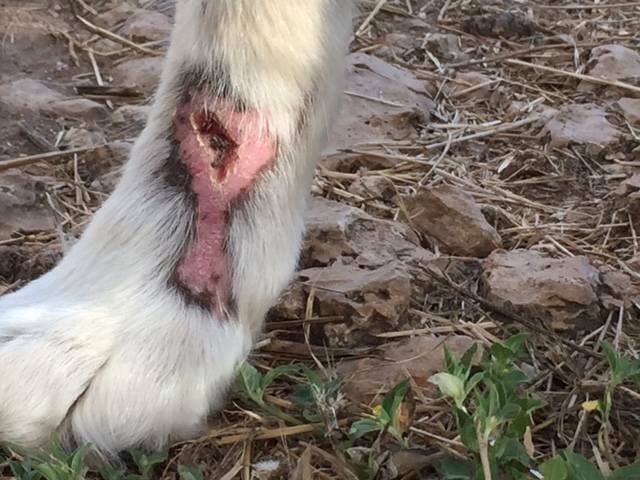 We have received photos, testimonies, along with general information on the cause and effect regarding using the oil with wounds. These are just tests, for more clinical trials on essential oils please reference the journals below to different research. 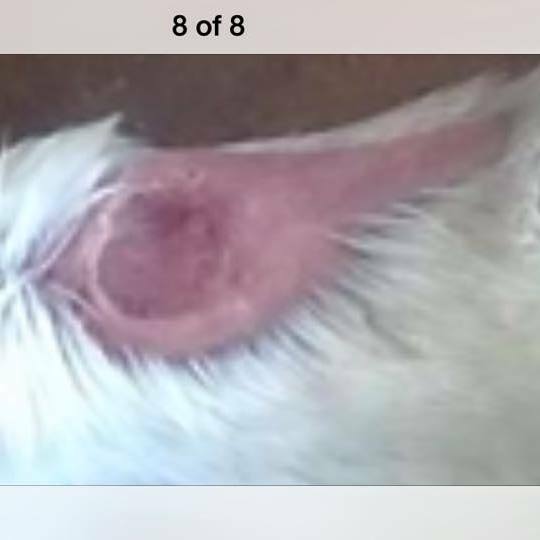 These photos show a wound that were observed in 2014, and Miracle oil was applied around wound, and photos are from a 32 hour timeline. Photo 1, 32 minutes after injury, Photo 2 day, 19 hours after injury, Phoro 3 14 days after injury. 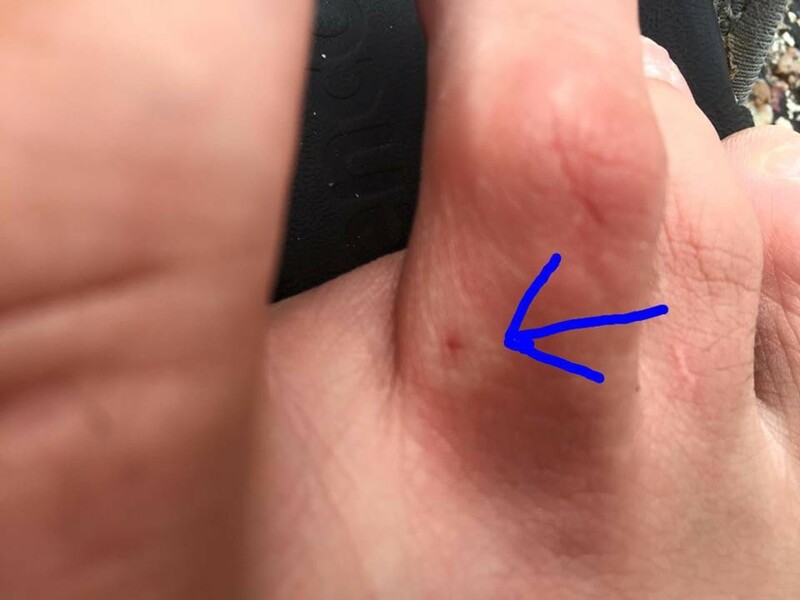 SJMO test shows after after 32 hours, wound is not bleeding, sealed, and healing. Wound comparison from Wikipedia show 14 DAYS, wound has not healed, and is still clearly inflamed, even showing bright redness around wound. 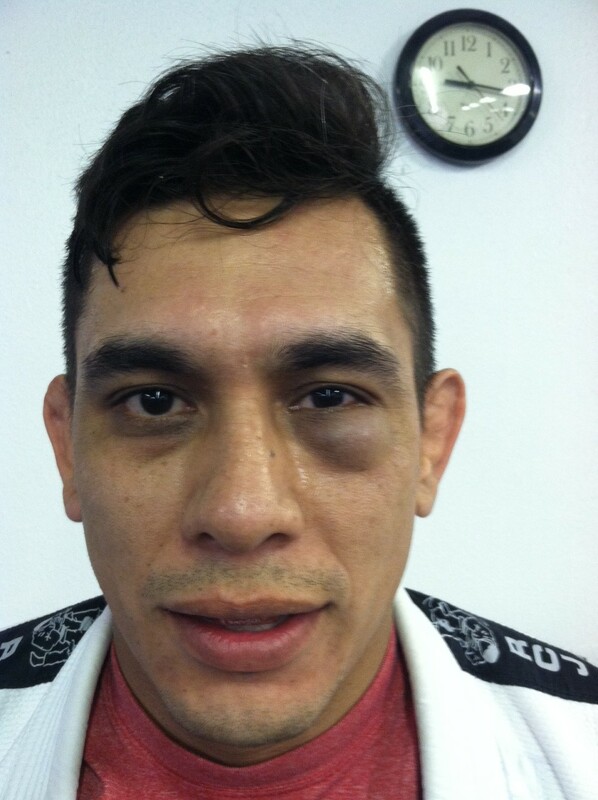 Here my student Mauricio obtained a black eye. 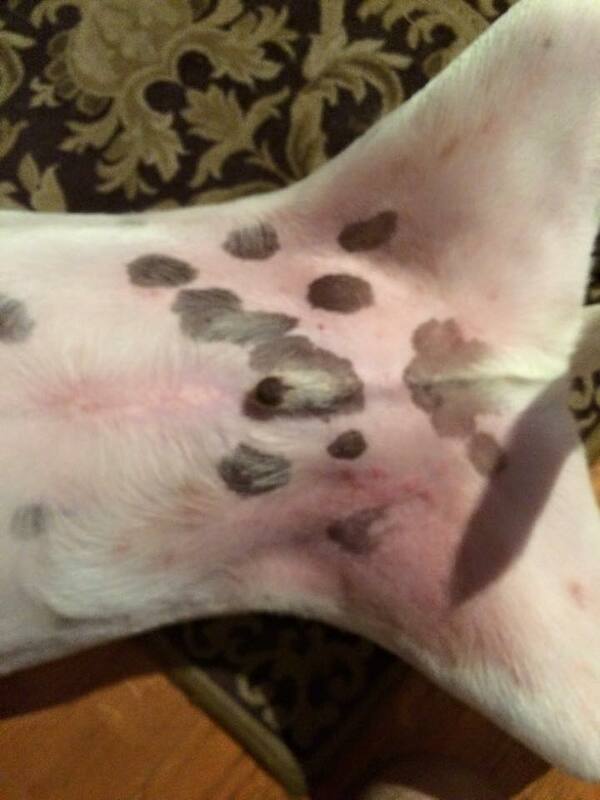 The hematoma is clear, yet we applied the oil. 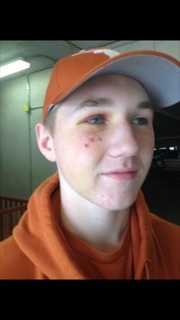 22 hours and 22 minutes later, the hematoma is gone. 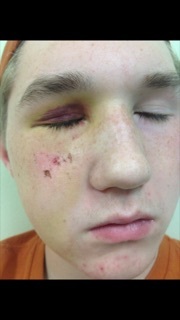 You can also compare the authenticity of the photo noticing the black eye is still fresh and dark, and has not faded out to a lighter color when healed after a week or so. Standard RICE therapy for 7-10 days is the usual therapy. What is the standard therapy and healing time according to WebMD? 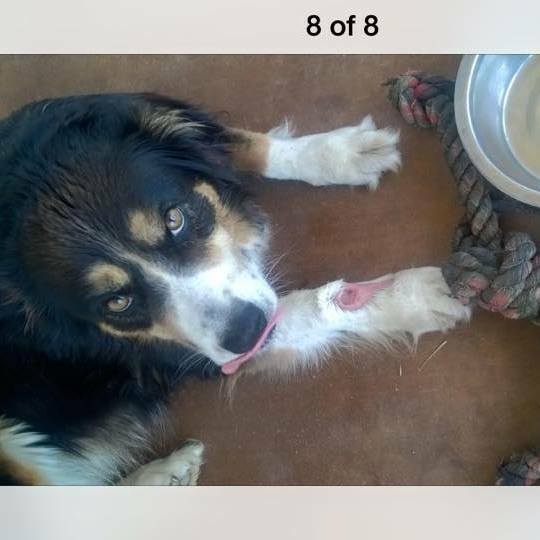 The two photos below are an eye wound. 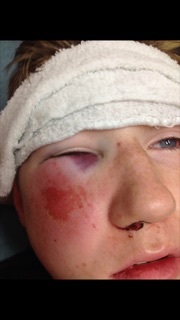 The clear tear in the eyelid area needed a few stitches. If you ever have any wound, please see your physician or ER immediately. Do not use our models for reference as a means of treating yourself. 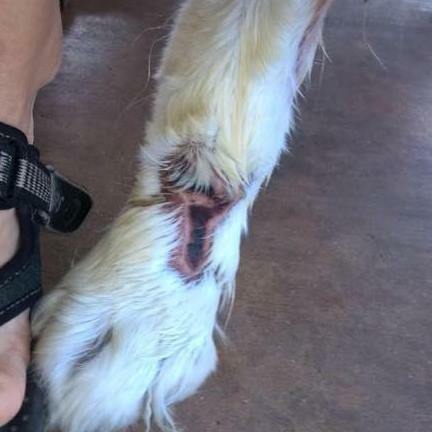 The oil was applied around the wound for five days. 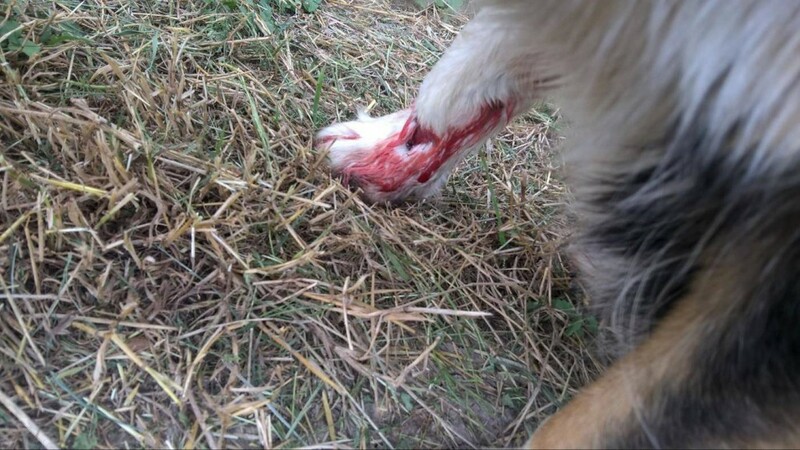 After approximately 45 minutes, the wound stopped bleeding and began to seal. I had one of my children’s parents contact me. Her son had burned his leg on a motorcycle and had an impressive deep 2nd degree burn. She notified me that her Medical Doctor was concerned and stated he was to be without any activity for almost two months. I have a copy of the doctor’s letter, and antibiotics and gauze changing were a mandatory requirement. If it were to be infected, an immediate visit to a local ER or appointment was required to not allow the infection to spread. 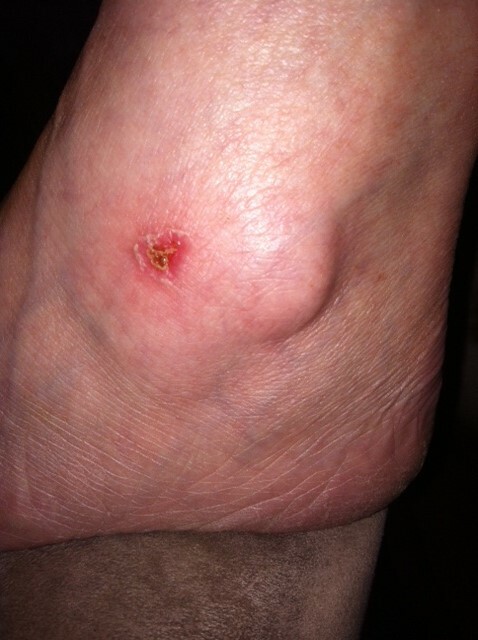 She used the oil and within a day the pain was reduced and within three days it was very manageable. In 10 days she posted photos on our facebook page which showed impressive results. Her final post shows day one, day 10 and day 20, which you can barely even see there was a burn. I would like more clinical trials, and perhaps we can do more to explore the effects of the oils. Upon researching essential oils that are also in our product, what do the medical journals say? Is there any scientific research to gear for future clinical trials on a more formal level than tests? The ever watchful FDA has a purpose. There are many claims of new cures, or product sales more than research. There is a valid reason the FDA regulates quick cures, or what we know take advantage of those concerned medically. We do not do that. We do not make claims of cures, or anything that prescribes medicine. More research is needed, and we always look forward to future clinical trials. More formal research and trials we aspire for. Curr Med Chem. 2003 May;10(10):813-29.Antibacterial and antifungal properties of essential oils. Kalemba D, Kunicka A.SourceInstitute of General Food Chemistry, Technical University of Lodz, Poland. Agrawal, A.K. 1997. Therapeutic efficacy of a herbal gel for skin affections in dogs. Indian Veterinary Journal, 74 (5): 417-419. Further research into the efficacy, safety, optimal uses, and standardization of herbal remedies is clearly needed. Inhibiting factors in the United States include the nonpatentability of herbal materials in a system in which the typical costs of double-blind testing for Food and Drug Administration (FDA) approval of drugs range in the millions of dollars, requiring patentability for private enterprises to attain a profit. Since herbal remedies currently remain in the category of dietary supplements, a different mechanism of funding for research is needed. The funding for complementary and alternative medicines research provided through the National Institutes of Health is meager compared with private and public funding of research for conventional drugs. Got Pain? You better read this! Different pains in this article are Chronic pain, and specifically Neurological pain, or Neuropathy and Spinal paralysis. I have Jiu-jitsu students or friends over the years due to pinched nerves, injuries and other causes develop neuropathy. I found a research journal on essential oils and neuropathy. Most of you reading this already know this, but for those that don’t, my wife and I invented the product St. Jude’s Miracle oil TM. The product is a proprietary trade secret of 9 essential oils originally designed to relieve pain for athletes. I have seen Neurological pain with new students, and new clients with pre-existing neuropathy. Let’s break down a few points on pain. Nociceptive pain, which includes visceral and somatic pain. Renal disease, heart and respiratory disease, endocrine diseases such as diabetes metabolic disorders, hormonal imbalances, toxins, connective tissue and inflammatory disorders, alcoholism, vitamin deficiencies, tumors (malignant and benign) and repetitive stress. Human immunodeficiency virus, herpes varicellazoster, herpes simplex virus, cytomegalovirus, Epstein-Barr virus, Lyme disease, diphtheria, leprosy and bacterial and viral infections. Fibromyalgia, multiple sclerosis, Guillain-Barre Syndrome, or acute inflammatory demyelinating neuropathy, chronic inflammatory demyelinating neuropathy, trigeminal neuralgia and multifocal motor neuropathy. Neuropathic pain can also be caused by a hereditary genetic abnormality, genetic mutations or by no known cause (idiopathic). 2.Serotonin-norepinephrine reuptake inhibitors such as Cymbalta and Effexor XR. 3.When those no longer work, opiates are prescribed. Opiates often used are Oxycontin, Oxycodone, Morphine Sulfate. Many Jiu-jitsu practitioners, athletes or general public generally have neck pain, usually in the cervical disk area, and a lot of those are rolling off your necks during the years of training, and of course those are also related to malnutrition where the collagen levels in the disks degenerate. I know so many fellow black belts that develop tingling, or nerve pain, chronic tightness in the neck or shoulder areas among others. Langley-Brady’s research shows different essential oils used, but I will specify more in the direction of the oils in our Miracle oil product specifically for Neuropathy/neuralgia and medical research in the ncbi or pubmed. A research study of an over the counter homeopathic remedy approved by the United States Food and Drug Administration (FDA), Neuragen PN, showed a reduction of at least fifty percent of pain reported by fifty-six percent of those study participants diagnosed with diabetic peripheral neuropathy (“Neuragen PN,” 2010, p. 5). The anti-inflammatory and antimicrobial effects of geranium essential oil altogether present treatment to individuals with diseases of bacterial or inflammatory etiology. Instrumentation (Instrumentation can also cause nerve irritation or damage). Cervical Cord and Root Injuries (Some patients have such tight (stenotic) canals that the act of opening the canal to decompress the spinal cord can cause injury). Arachnoiditis (Arachnoiditisis inflammation of the membrane that surrounds the nerves in the canal). During spine surgery, there exists the possibility that a small rent (or tear) of the dura will occur. Most commonly, it occurs when attempting to remove material such as bone, ligament (ligamentum flavum), cyst, or disc material that is scarred or stuck to the dura. The incidence of dural tear increases with a history of prior surgery in the same area from scar formation. Symptoms of a dural leak: most commonly, patients describe a positional headache in which standing aggravates and laying down improves and/or resolves the headache. Other commonly reported symptoms include the following: nausea, dizziness, ringing in the ears and a feeling of malaise/fatigue. Physical exam findings may note a swollen incision. Further treatments, if a dural leak were to persist despite primary repair during surgery, include the following: blood patch, use of caffeine, and consideration of a ‘diverting drain’. On rare occasions, re-operation must be considered. Basically it shows the importance of collagen relating with dura mater. Similar to disk degeneration, basically the repair of the tissue is needed, and usually through surgery. Given the use of the Boswellia resin to treat all kinds of injuries as well as inflammatory conditions, the effects of its major anti-inflammatory constituent, IA mice following head trauma was examined. Its anti-inflammatory effects were thus associated with improved neurobehavio, on ral and cognitive functions in a mouse model of traumatic brain injury (Pettigrew et al., 2008). Even at normal NSAID dosages, people with compromised kidney function can develop NSAID toxicity”. 1. Adverse effects of NSAIDs cause 103,000 hospitalizations and 16,500 deaths per year in the United States. 2. In patients with such a history, however, use of NSAIDs (aside from low-dose aspirin) was associated with more than 10-fold increase in heart failure. 3. “You may as well wear a sign, ‘Please kill my kidneys’”(4, Rice University). Wintergreen acts as an anti-inflammatory agent (1-4). The medicinal properties of peppermint oil are analgesic, anti-septic, anti-inflammatory, and antimicrobial, among others (5). Lavender has anti-inflammatory and analgesic properties (6), and pain relief assessment (7). Eucalyptus Blue has anti-inflammatory and analgesic properties (8). Clove bud has anti-infectious properties include: anti-viral, anti-bacterial, anti-fungal effects (9-10). Geranium has shown temporary relief of neuralgia pain (11). Clary Sage in pain relief on outpatients with primary dysmenorrhea (Painful menstration) (12). Myrrh oil has anti-inflammatory and analgesic activity (14). Skeletal diseases may be induced by malnutrition that involves certain nutrients, notably calcium, phosphorus, and vitamin D, but also iodine, copper, zinc, manganese, fluorine, silicon, vitamin A and perhaps vitamin C, as well as protein and energy. The number of these nutrients. Malnourished patients are more likely to have complications following total knee or hip replacement surgeries than morbidly obese patients, according to new research from researchers at the Perelman School of Medicine at the University of Pennsylvania. The findings are being presented at the American Academy of Orthopaedic Surgeons Annual Meeting, and their interactions is so large that dietary intervention in bone abnormalities is likely to be most effective if directed at consumption of a diet that is completely balanced for growth, maturity, old age, or stress. I have many students and customers from the USA that keep purchasing the oil to help whether it smells good, sinuses, pain, or whatever they use it for. We get orders from the UK, Australia too. Even NBA players use our product. When I speak to the blind, many do not know a majority of blindness is preventable. Did you know, according to the World Health Organization, that 80% of all visual impairment can be avoided or cured? As referenced on another website, Essential oils do not require FDA approval, however manufacturers are not allowed to claim that they prevent or treat illness. We do not make claims such as those, but oils in our product have been used separately in clinical trials in medical journals I have researched. 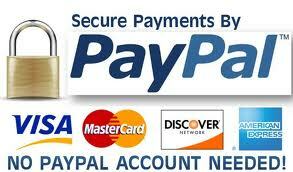 Disclaimer: The information presented on this site is not intended for diagnostic or treatment purposes. Please consult your own physician for medical advice or services. The information provided on this website is intended for informational purposes only, and should not be considered a replacement for the expert advice of a qualified health practitioner. www.stjudesmiracleoil.com, www.austinbjj.com and www.williamvandry.com makes no representations as to accuracy, completeness, currentness, suitability, or validity of any information on this site and will not be liable for any errors, omissions, or delays in this information or any losses, injuries, or damages arising from its display or use. All information is provided on an as-is basis. (Worwood, 1991, p. 39). Worwood, V. A. (1991). The complete book of essential oils & aromatherapy. Novato, CA: New World Library. Department of Pharmacology, Yale University School of Medicine, 333 Cedar St., New Haven, CT06520. 2013 Jun 29. pii: S0304-3959(13)00364-3. doi: 10.1016/j.pain.2013.06d other painful conditions. http://www.lef.org/protocols/appendix/otc_toxicity_01.htm (Whelton A et al 1991). An estimated 10-20% of NSAID patients experience dyspepsia, and NSAID-associated upper gastrointestinal adverse events are estimated to result in 103,000 hospitalizations and 16,500 deaths per year in the United States, and represent 43% of drug-related emergency visits. Many of these events are avoidable; a review of physician visits and prescriptions estimated that unnecessary prescriptions for NSAIDs were written in 42% of visits. Kearney, Pm; Baigent, C; Godwin, J; Halls, H; Emberson, Jr; Patrono, C (June 2006). “Do selective cyclo-oxygenase-2 inhibitors and traditional nonsteroidal anti-inflammatory drugs increase the risk of atherothrombosis? Meta-analysis of randomised trials”(Free full text). BMJ (Clinical research ed. )332 (7553): 1302–8. doi:10.1136/bmj.332.7553.1302.ISSN 0959-8138. PMC 1473048. PMID 167405583-Page, J; Henry, D (March 2000). “Consumption of NSAIDs and the development of congestive heart failure in elderly patients: an under recognized public health problem” (Free full text). Archives of internal medicine 160 (6): 777–84.doi:10.1001/archinte.160.6.777. ISSN 0003-9926. PMID 10737277. A novel naturally occurring salicylic acid analogue acts as an anti-inflammatory agent by inhibiting nuclear factor-kappaB activity in RAW264.7 macrophages. Zhang T, Sun L, Liu R, Zhang D, Lan X, Huang C, Xin W, Wang C, Zhang D, Du G.Mol Pharm. 2012 Mar 5;9(3):671-7. doi: 10.1021/mp2003779. Epub 2012 Feb 15. Evaluation of the new anti-inflammatory compound ethyl salicylate 2-O-β-d-glucoside and its possible mechanism of action. Xin W, Huang C, Zhang X, Zhang G, Ma X, Sun L, Wang C, Zhang D, Zhang T, Du G.Int Immunopharmacol. 2012 Dec 4;15(2):303-308. doi:10.1016/j.intimp.2012.11.014. Mullally BH, James JA,CoulterWA,LindenGJ. The efficacy of a herbal-based toothpaste on the control of plaque and gingivitis. J Clin Periodontol. 1995;22(9):686–9. Phytochemical composition of Cymbopogon citratus and Eucalyptus citriodora essential oils and their anti-inflammatory and analgesic properties on Wistar rats. Gbenou JD, Ahounou JF, Akakpo HB, Laleye A, Yayi E, Gbaguidi F, Baba-Moussa L, Darboux R, Dansou P, Moudachirou M, Kotchoni SO. SourceLaboratoire de Pharmacognosie et des Huiles Essentielles, Faculté des Sciences de la Santé, Faculté des Sciences et Techniques, Université d’Abomey Calavi, 01 BP 918,Cotonou,Benin. Curr Med Chem. 2003 May;10(10):813-29.Antibacterial and antifungal properties of essential oils. Kalemba D, Kunicka A.SourceInstitute of General Food Chemistry, TechnicalUniversity of Lodz,Poland. 20Greenway, f, Frome & Engels, T. (2003). Temporary relief of postherpetic neuralgia pain with topical geranium oil. American J of Medicine, 115, 586-587. Pain relief assessment by aromatic essential oil massage on outpatients with primary dysmenorrhea: a randomized, double-blind clinical trial. Ou MC, Hsu TF, Lai AC, Lin YT, Lin CC. SourceDepartment of Applied Cosmetology, HungkuangUniversity, Taichung, Taiwan. Anti-inflammatory and analgesic activity of different extracts of Commiphora myrrha. Source:JiangsuKey Laboratory for TCM Formulae Research,NanjingUniversityof Chinese Medicine,Nanjing210046, PR China.